When you think of the perfect setting for an in-home newborn session, I could think of nothing better than this sweet family’s home. It was cozy, it was comfortable, and it was filled with light and love for the newest addition to the family, Sloane. 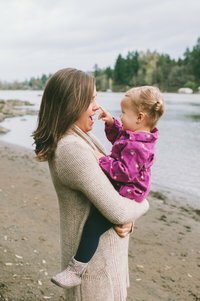 When mom, Jill, and I first started talking about their session, I was so thankful for Jill’s love of lifestyle photography and the sweet candid interactions that can be captured in those moments. She did an amazing job of taking my direction to heart and their session was absolutely breathtaking. I absolutely loved their cozy and relaxed outfits that went perfectly with their comfortable home. As I was welcomed in their front door, big-brother Brooks was eating a slice of banana bread with a little bit of a frown on his face. I told Jill not to worry, the 2-4 year old range is my favorite age and we would have him smiling in no time. Brooks turned out to be such a bundle of joy. He loved playing hide-and-seek, having tickle wars with mom and dad, and was so proud when it was his turn to hold baby Sloane and take pictures with her. Sloane was the sweetest bundle of joy with the thickest, darkest head of hair you’ve maybe ever seen on a newborn. She slept soundly most of the time, but loved opening her eyes once in a while to catch a glimpse of mom or dad staring back at her. This newborn session is full of real. It’s full of life. It’s full of a normal family doing life together with two kids. And I was so thankful to be welcomed in to capture a little snippet of that life. I hope you love the pictures as much as I do (there’s the sweetest picture of Brooks laying on the bed with Sloane, he took her hand into his and gave it the gentlest kiss). Enjoy! Need a Denver newborn photographer? Meet Larissa. Larissa is an in-home lifestyle newborn photographer based out of Colorado. She’d take an adventure in the mountains over shopping any day + a date night snuggling on the couch over dinner and a movie. Larissa’s obsessed with: morning snuggles with her rescue pup, Hazel, hot chocolate, a good book and yoga pants. She believes in making you forget a camera’s even there, that your story is the actual thing she wants to capture on camera and that real, raw moments are more important that perfectly curated poses. Book your Denver Newborn Photographer.